Ian was a member of the 2012 Canadian Olympic 4x100m Relay team. He also wrote Why the 100m Is the Most Difficult Race back in 2010. His new book is called “Endure – An Athlete’s Guide to Faith, Hope, and Success” and the purpose is to inspire and educate athletes on the importance of not giving up in life. The book features 50 athletes from different sports and that all tell their story of the hardest thing they have ever been through as an athlete, how they endured through those times, and how it made them who they are today. These stories were combined with with biblical stories and other personal inspirations to help get the message across. It is December of 2007. I was in the middle of my base training and had just graduated from Florida State University with my Master’s degree. I had a standing offer letter from Deloitte to start working in Atlanta in January of 2008, yet I was in the midst of training for my 2nd Olympic Games. Having come off probably my best year on the IAAF circuit in 2007 and still unable to renew my contract with Nike, taking the Deloitte offer was the logical solution. This was an opportunity to begin earning a steady and reliable income. It made sense. My family was in the United States for my cousin’s graduation, and they were imposing upon me to stick with Deloitte. However deep inside, I wanted another opportunity to take a crack at the Olympics. See back in 2004, coming of my senior season in college, I went to the Olympic in Athens and performed dismally but I still finished the year as the 7th fastest individual in the 200m dash that year. I always knew that if Coach Ken Harden and I planned it right, we would have a legitimate opportunity of making the final. That’s all we could ask for, an opportunity to be in the Olympic final. I called Deloitte; they were surprisingly ecstatic and deferred my start date to October of 2008. The spring of 2008 rolled around and I was training well for the upcoming summer. Being an international student comes about with all sorts of immigration complications. For the past four seasons I had travelled back and forth to Europe in the summer time when I was competing giving me a chance to fly back to Tallahassee and get some quality training with my coach every two weeks. Due to the fact that I had graduated, the situation had changed and I was misinformed or I misunderstood the instructions I received from the international student office. I decided to make a trip to Juarez, Mexico, which shares a border with El Paso, Texas to renew my American student visa. Unbeknown to me, Juarez was and probably still is one of the most dangerous drug towns in Mexico. I planned my trip well and had a guide that took a group of people to the US consulate in Juarez. This was by appointment basis only. When my turn arrived at the booth to be interviewed, to cut a long story short, my visa application was denied. Not only was it denied, the consular office went ahead and cancelled my current visa as my presence there was in violation of my current visa status. What did this mean? As of that moment, this meant that with the little I had i.e. $60 and an American Express card and my back pack, and not to mention that I was wearing just shorts, I had to find my way back to Harare, Zimbabwe via Mexico City from Juarez. My whole world had collapsed. What was going to become of my Olympic dream? I started thinking that maybe I should have stuck with the Deloitte offer. What was going to become of my car and my other personal belongings? The time was about 3.30pm. At this point, I had no right of entry back into the United States. I promptly made my way back to the border. I remember this vividly. The border was busy around rush hour with people commuting back and forth to the US and Mexico and the border officers were irritable at this time of the day. When my turn came to speak to one of the officers, I started stuttering trying to explain my situation. He wasn’t trying to hear my story and told me that I had to figure out a way to get myself back to Zimbabwe. I left and went and booked a place at a local Holiday Inn. I lay on my bed gazing at the ceiling. My Verizon phone was not catching any reception at this point too so there was no one I could call. I clearly remember that this was the first time in my life when there was nothing that any individual could do to help me. Nothing……I could not call anyone, I could not reach out to anyone, I was in this foreign land where I knew no one. Trust me, I became a prayer warrior. I prayed in my hotel room for at least 45 minutes asking God to intervene and make a plan where everything seemed impossible. I decided to go back to the border after 7pm knowing that the rush hour craze was over and perhaps the officers there would have the patience to listen to my situation. When I arrived, I remember telling myself to pray. There was a restroom, and inside those restrooms the toilets were pit latrines. This by far one of the worst restrooms I had ever come across. I knelt down and I prayed asking for God’s intervention. True story. I went back and joined the line. When my turn came, I was directed to a different officer, different from the one I had dealt with earlier. I asked the new officer if he would allow me to sit back down so I could deal with the same officer from earlier because I did not want to make it seem like I was avoiding him and trying my luck with somebody else. The new officer agreed. When my turn came up again to go to the earlier officer, I told him my story again and again he wasn’t keen on helping me out. I begged him to call a supervisor in case there was something they could do to help me out. As he was telling me no, a supervisor walked by and noticed that I had been talking to this officer for a while. He walked up and asked what was going on. I told him my story and how I had been misinformed and all I was trying to do was to prepare for the Beijing Olympics. This man simply went online and corroborated some information I had told him about me being an athlete and he immediately gave me a 30-day B-1 visa. He told me to get back to the USA and sort out my affairs and leave the country. God is good. My prayers had been answered. I knew once I was back in the US with the help of a lawyer, I would be able to extend my stay and figure out the best visa to apply for. I returned to the US, without having to extend my B-1 visa, was awarded an H-1 visa through Deloitte and I was able to travel that summer freely. 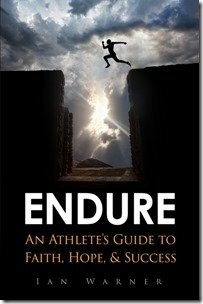 Please read “Endure – An Athlete’s Guide to Faith, Hope, and Success” for more inspirational stories. Ian Warner was a track and field all-American at Iowa State University and represented Canada at the 2012 Olympics. He is also the founder of Kho Health which helps connect injured athletes with the best sports medicine solutions.